Aortic valve — The valve between the left ventricle of the heart and the aorta. Bacteremia — An infection caused by bacteria in the blood. Congestive heart failure — A condition in which the heart muscle cannot pump blood as efficiently as it should. Echocardiography — A diagnostic test using reflected sound waves to study the structure and motion of the heart muscle. Embolus — A bit of foreign material, such as gas, a piece of tissue, or tiny clot, that travels in the circulation until it becomes lodged in a blood vessel. Endocardium — The inner wall of the heart muscle, which also covers the heart valves. Mitral valve — The valve between the left atrium and the left ventricle of the heart. Osler's nodes — Small, raised, reddish, tender areas associated with endocarditis, commonly found inside the fingers or toes. Petechiae — Tiny purple or red spots on the skin associated with endocarditis, resulting from hemorrhages under the skin's surface. Pulmonary valve — The valve between the right ventricle of the heart and the pulmonary artery. Transesophageal echocardiography — A diagnostic test using an ultrasound device, passed into the esophagus of the patient, to create a clear image of the heart muscle. Tricuspid valve — The valve between the right atrium and the right ventricle of the heart. Vegetation — An abnormal growth of tissue around a valve, composed of blood platelets, bacteria, and a protein involved in clotting. atypical verrucous endocarditis Libman-Sacks e.
bacterial endocarditis infectious endocarditis caused by various bacteria, including streptococci, staphylococci, enterococci, gonococci, and gram-negative bacilli. infectious endocarditis , infective endocarditis that due to infection with microorganisms, especially bacteria and fungi; currently classified on the basis of etiology or underlying anatomy. Libman-Sacks endocarditis nonbacterial endocarditis found in association with systemic lupus erythematosus, usually occurring on the atrioventricular valves. Löffler's endocarditis , Löffler's parietal fibroplastic endocarditis endocarditis associated with eosinophilia, marked by fibroplastic thickening of the endocardium, resulting in congestive heart failure, persistent tachycardia, hepatomegaly, splenomegaly, serous effusions into the pleural cavity, and edema of the limbs. mycotic endocarditis infectious endocarditis, usually subacute, due to various fungi, most commonly Candida, Aspergillus, and Histoplasma. nonbacterial thrombotic endocarditis (NBTE) that usually occurring in chronic debilitating disease, characterized by noninfected vegetations consisting of fibrin and other blood elements and susceptible to embolization. prosthetic valve endocarditis infectious endocarditis as a complication of implantation of a prosthetic valve in the heart; the vegetations usually occur along the line of suture. rheumatic endocarditis that associated with rheumatic fever; more accurately termed rheumatic valvulitis when an entire valve is involved. rickettsial endocarditis endocarditis caused by invasion of the heart valves with Coxiella burnetii; it is a sequela of Q fever, usually occurring in persons who have had rheumatic fever. vegetative endocarditis , verrucous endocarditis endocarditis, infectious or noninfectious, the characteristic lesions of which are vegetations or verrucae on the endocardium. an inflammation of the endocardium and heart valves. The condition is characterized by lesions caused by a variety of diseases. Kinds of endocarditis are bacterial endocarditis, nonbacterial thrombotic endocarditis, and Libman-Sacks endocarditis. All types of endocarditis are rapidly lethal if untreated, but most patients with endocarditis are successfully treated by various antibacterial and surgical measures. See also bacterial endocarditis, subacute bacterial endocarditis. Cardiology Inflammation of the endocardium. See Culture-negative endocarditis, Non-bacterial endocarditis, Subacute bacteria endocarditis. Infective endocarditis with a rapid onset, usually a few days to 2 weeks. The infection is typically caused by virulent organisms such as Staphylococcus aureus, which may rapidly invade and destroy heart valvular tissue and also metastasize to other organs or tissues. An infrequently used term for nonbacterial thrombotic endocarditis. Infective endocarditis produced by organisms that do not quickly or readily grow in blood cultures, usually because their growth is masked by the previous use of antibiotics or because the causative organisms require special culture media or grow slowly in the laboratory. Mycoplasma, Ricksettsia, HACEK (an acronym for Haemophilus, Actinobacillus, Cardiobacterium, Eikenella, Kingella) organisms, and some fungi produce culture-negative endocarditis. Endocarditis caused by any microorganism, esp. any species of streptococci or staphylococci, and less often by Haemophilus spp. or other HACEK bacteria (e.g., Actinobacillus actinomycetem comitans, Cardiobacterium hominis, Eikenella corrodens, or Kingella kingae), enteric bacteria, ricksettsiae, chlamydiae, or fungi. Traditionally, IE can be categorized as acute if the illness has a fulminant onset; catheter-related if the causative microorganism gains access to the heart from an indwelling line; culture-negative if echocardiograms reveal vegetations and other criteria for the disease are present, but the causative microbes have not been isolated in the laboratory; left-sided if it develops on the mitral or aortic valves; nosocomial if it occurs after 48 hr of hospitalization or an invasive surgical procedure; pacemaker-related if the disease occurs on an implanted pacemaker or cardioverter-defibrillator; prosthetic if it occurs on a surgically implanted heart valve; right-sided if it develops on the tricuspid or pulmonary valves; and subacute if it develops after several weeks or months of anorexia, low-grade fevers, and malaise. The incidence in the U.S. is about 2 to 4 cases per 100,000. Patients who are elderly or have a history of injection drug abuse, diabetes mellitus, immunosuppressing illnesses, aortic stenosis, mitral valve prolapse, or rheumatic heart disease are more likely than others to become infected. Blood cultures, esp. if persistently positive, form the basis for the diagnosis of endocarditis. Contemporary criteria for diagnosis also include visual confirmation of endocardial infection (vegetations) by echocardiography, the presence of several other suggestive anomalies (e.g., persistent fevers in a patient who is known to inject drugs or a patient with an artificial heart valve), infective emboli in the lungs or other organs; and characteristic skin findings. Occasionally, a patient who dies of a febrile illness may be found to have infective vegetations on the heart valves at autopsy. Endocarditis is deadly in about 10% to 25% of patients. Death is most likely to occur in patients who suffer strokes resulting from infected fragments embolizing to the brain and in patients who suffer congestive heart failure. Patients with right-sided endocarditis have a better prognosis than patients with other forms of the disease. Many patients recover after treatment with prolonged courses of parenteral antibiotics. Some (e.g., those with heart failure or severely injured hearts) may not respond without surgery to replace damaged valves or débride abscesses within the myocardium. During the acute phase of treatment, patients are monitored for signs and symptoms of heart failure (e.g., dyspnea, orthopnea, crackles, dependent edema, changes in the heart murmur, and a postsystolic gallop), cerebral emboli (e.g., paralysis, aphasias, changes in mental status), and embolization to the kidney (e.g., decreased urine output, hematuria); lung involvement (e.g., dyspnea, cough, egophony, hemoptysis, pleuritic pain, or friction rub) or spleen involvement (e.g., left upper quadrant abdominal pain radiating to the left shoulder, abdominal rigidity); and peripheral vascular occlusion (e.g., numbness or tingling, changes in pulses, pallor, and coolness in an extremity). Blood cultures may be taken periodically to monitor the effectiveness of antibiotic therapy. Before the administration of antibiotics, a history of allergies is obtained. Treatment peak and trough drug levels are checked (e.g. when aminoglycoside or vancomycin is given) to maintain therapeutic levels and prevent toxicity. Supportive treatment includes bedrest, sufficient fluid intake to preserve hydration, and aspirin or acetaminophen for fever and aches. Passive and active limb exercises are used to maintain muscle tone and quiet, diversional activities to prevent excessive physical exertion until a slow, progressive activity program that limits cardiac workload can be established. The American Heart Association recommends that patients at high risk for endocarditis should receive prophylactic antibiotics prior to many procedures, including dental and periodontal cleanings and extractions, intraligamentary local anesthetic injections, tonsillectomy, adenoidectomy, bronchoscopy with rigid instrument, sclerotherapy for esophageal varices, esophageal stricture dilation, biliary tract procedures, barium enema or colonoscopy, surgery involving the respiratory or intestinal mucosa, prostate surgery, cystoscopy, and urethral dilation. 1. An old term for endocarditis that is rapidly fatal. 2. Valvular vegetations composed of tumor cells. Endocarditis of the lining of the heart but not the heart valves. Infective endocarditis occurring on a patient's own heart valve(s), rather than on a prosthetic (surgically implanted) valve(s). Endocarditis affecting the tricuspid or pulmonary valve. It is usually the result of a percutaneous infection and is most often seen in injection drug users. Endocarditis due to syphilis having extended from the aorta to the aortic valves. Endocarditis caused by Mycobacterium tuberculosis. A rapidly destructive form of acute bacterial endocarditis characterized by necrosis or ulceration of the valves. Endocarditis affecting the heart valves and not the inner lining of the heart. Endocarditis associated with fibrinous clots on ulcerated valvular surfaces. Inflammation of the inner lining of the heart and of the heart valves, from infection, immune system disturbances or the effect of the death of overlying muscle from CORONARY THROMBOSIS. Heart valve damage from previous RHEUMATIC FEVER, congenital heart disease, the presence of artificial heart valves or damage from cardiac catheters all predispose to the condition. Intravenous drug abusers are also extremely prone to develop infective endocarditis. Without effective treatment infective endocarditis is usually progressive and the condition is rapidly fatal. exudative and proliferative inflammatory alterations of the endocardium, characterized by the presence of vegetations on the surface of the endocardium or in the endocardium itself, and most commonly involving a heart valve, but also affecting the inner lining of the cardiac chambers or the endocardium elsewhere. Lesions on the valves may interfere with the ejection of blood from the heart by causing insufficiency or stenosis of the valves. Murmurs associated with the heart sounds are the major manifestation and if interference with the blood flow is sufficiently severe congestive heart failure develops. The further hazard with endocarditis, especially if it is bacterial in origin, is that of septic emboli in the lungs or in the other organs. infectious endocarditis, acute or subacute, caused by various bacteria, including streptococci, staphylococci, enterococci and gram-negative bacilli. Of particular interest in animals is the predilection of Erysipelothrix rhusiopathiae to cause endocarditis, epecially in pigs. due to thrombosis in a persistent ductus arteriosus with resulting mural inflammation. that due to infection with microorganisms, especially bacteria and fungi. that affecting the lining of the walls of the heart chambers only. that in which the vegetations, single or multiple, consist of fibrin and other blood elements. that resulting from extension of a tuberculous infection from the pericardium and myocardium. that affecting the membrane over the heart valves only. 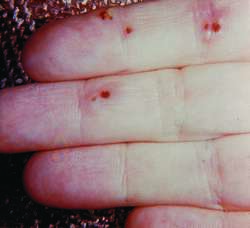 endocarditis, infectious or noninfectious, the characteristic lesions of which are vegetations or verrucae on the endocardium. Called also verrucous endocarditis. Even though infective endocarditis is rare in children, it is associated with considerable morbidity and mortality. Blood culture-negative endocarditis in a reference center: etiologic diagnosis of 348 cases. During this period of two years, 91 patients were screened for infective endocarditis. Previous studies have identified the following presentations (1) cardiac valvulopathy or valvular prostheses defects, (2) fever without leukocytosis, (3) immunocompromised, (4) periprosthetic leak in the absence of vegetations - place BCNE patients at risk of Q fever endocarditis. Mortality from fungal endocarditis as high as 72% was found in an analysis of 270 cases over 30 years. Because there was a high suspicion of infective endocarditis, a two-dimensional transthoracic echocardiography (2D TTE) was performed, which revealed a mobile hyperechoic mass (>10 mm) attached to the aortic leaflets (Figure 2) and thickened anterior mitral leaflet (on its septal insertion). On physical exam, HACEK-associated infective endocarditis may present as a new murmur or change in a heart murmur. A few decades ago infective endocarditis was considered the disease of the young adult, with most frequent rheumatic valvular involvement. All of the cases were left-sided endocarditis, with the majority involving the aortic valve. Risk factors for Bartonella endocarditis include homelessness, alcoholism, infestation with body lice (B.
Infective endocarditis (IE) is coupled with a high risk of morbidity and mortality. A set of diagnostic aids between infective endocarditis and small-vessel vasculitis has been previously outlined (Table 2) .